Totally circa 1975, right? I think all my friends’ had this or something similar to it hanging in their houses growing up. It doesn’t look too bad actually, just reminds me of days long ago. 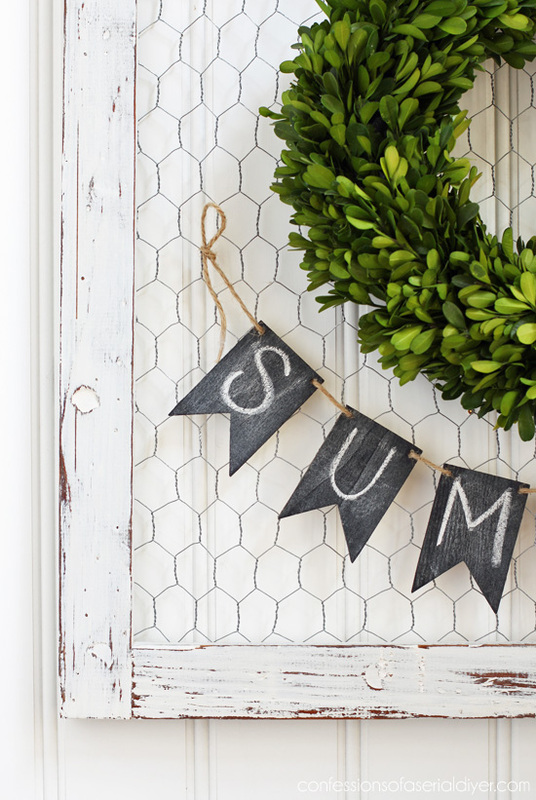 Today I’m ditching the Fall fiesta for chicken wire! 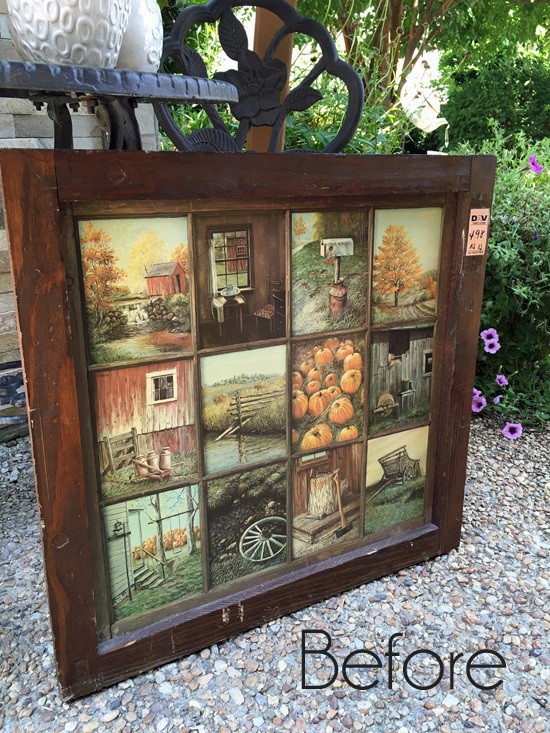 I loved how rustic the frame was when I saw it and knew it would paint up perfectly shabby. This is ONE coat of pure white DIY Chalk Paint, and a good sanding with 220 grit sandpaper. You can see this makeover HERE. This was an old window that was once covered in clamshells. 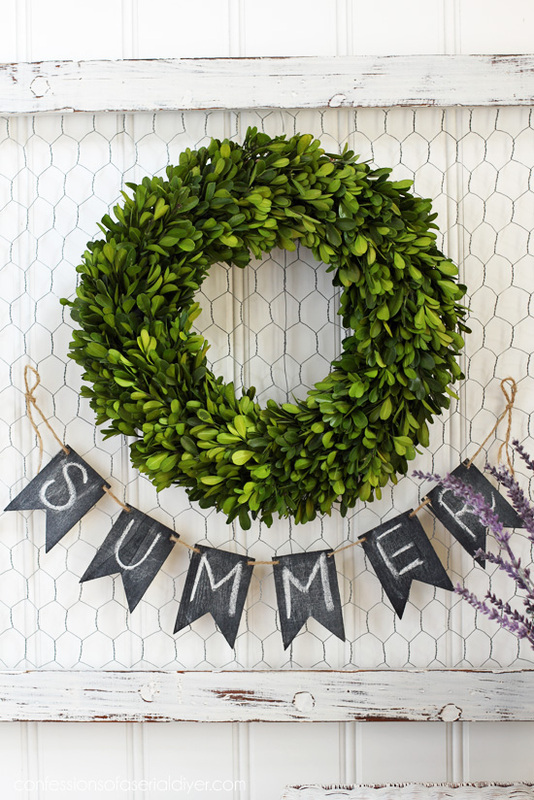 I borrowed the banner and boxwood wreath from my current mantel to use here. 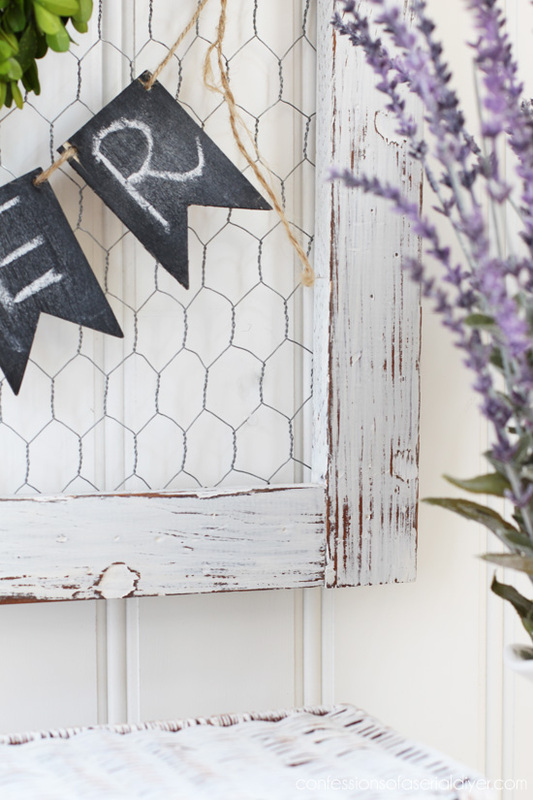 I really love the timeless Farmhouse feel of the weathered wood and chicken wire. Of course you could also use this to display photos, or organize notes or mementos as well using clothespins like I did HERE. 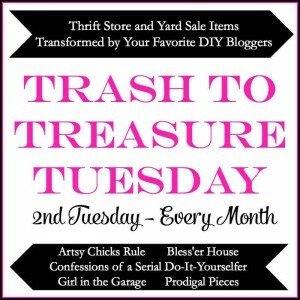 As I promised, my thrifty lovin girls also have a makeover to share today! Click the links below the collage to take you to each makeover…enjoy! I’ll be back on Thursday with my Décor Enthusiast Girls. 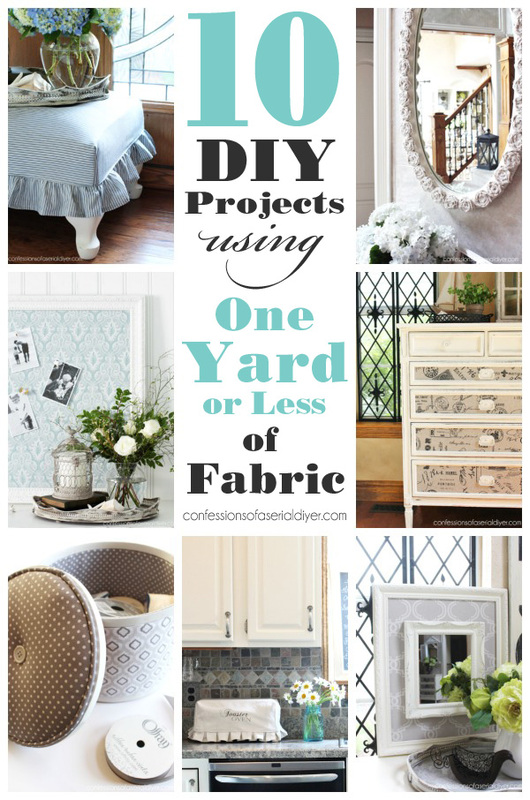 This month’s theme is: “What can you do with a yard or less of fabric?” Well, lot’s of things!! UPDATE: HERE are 10 simple projects I pulled from my archives that use a yard or less of fabric each, and I think only two required a sewing machine! See ya later country and Hello chic! 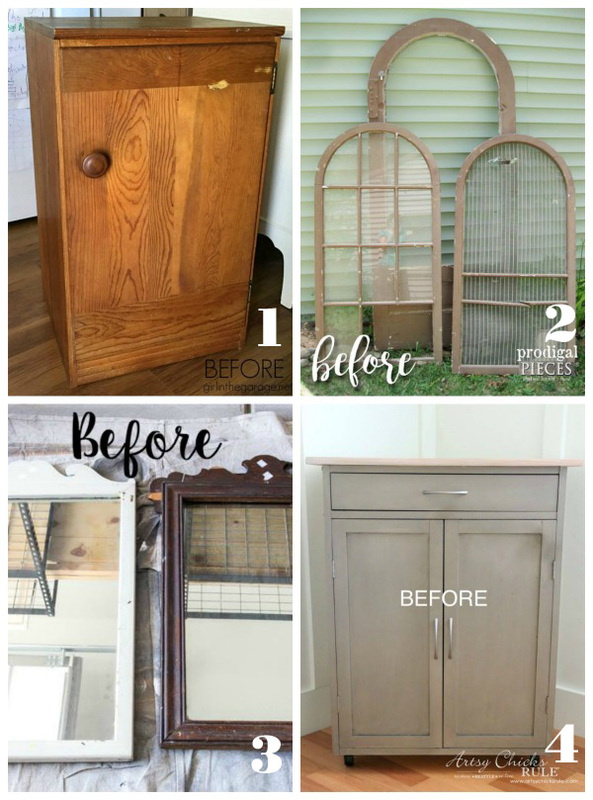 Love this repurpose, Christy. It’s fun and oh so versatile too. High five!! 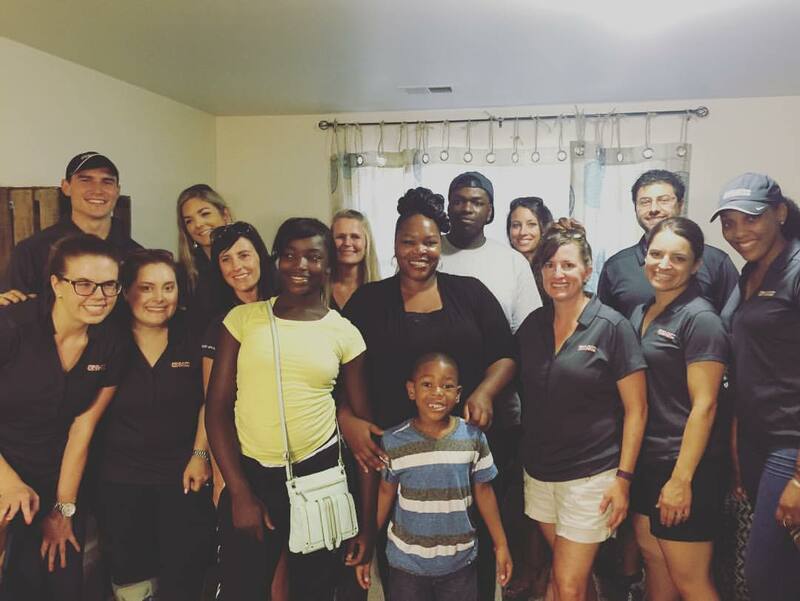 Congrats on the excellent job on the Habitat home too. I have to say I had a friend that had the exact same picture and I love how you repurposed it into an adorable farmhouse look! I would not have thought of that! Great job! My next house is going to have the farmhouse look with a little bit of shabby chic and French Country mixed in. I’ve spent many hours saving pictures to my Pinterest board so when the time comes I will get my inspiration & ideas for each room. Thanks, Sandi! Ha ha see? We didn’t have one in our home, but many friends did! 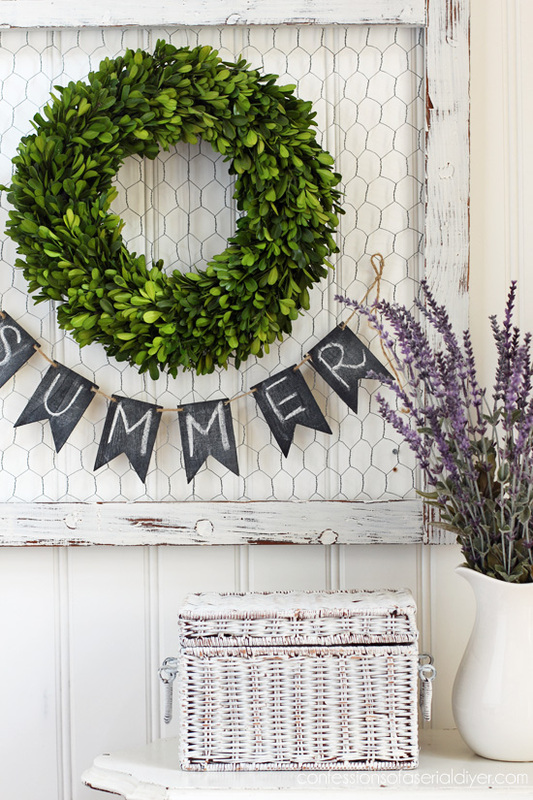 I love the style you’re going for and so much inspiration on Pinterest! Christy, you win gold in the Olympic sport of taking hideous pieces and making them magnificent! I love the setting for the frame, too. 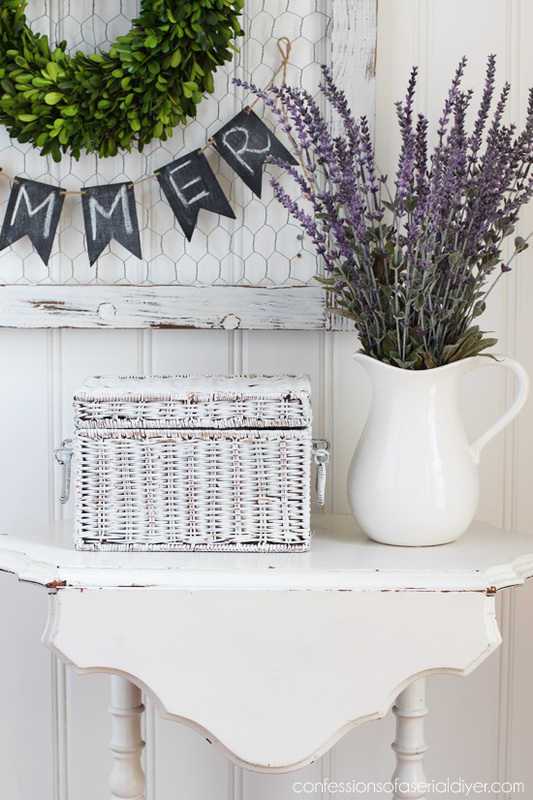 The chippy basket and the painted table are pretty fabulous. Can’t wait to see pictures from your big trip. Looks like it was a great time. I had that picture back in the day. Got it at a Home Interior party. Love the transformation. You’re imagination is amazing. Love the transformation! I have a frame that I picked up at Amvets and I’m undecided of what to do with it. I’ll have to send you a pic so you can give me suggestions for this one. So so cute! You are truly talented. Yes, I spotted you there in the back. Makes me wish I still had my picture like that from the 70s. Who knew it could look so cute???? That old frame looks FAB now with the white distressed paint and chicken wire! 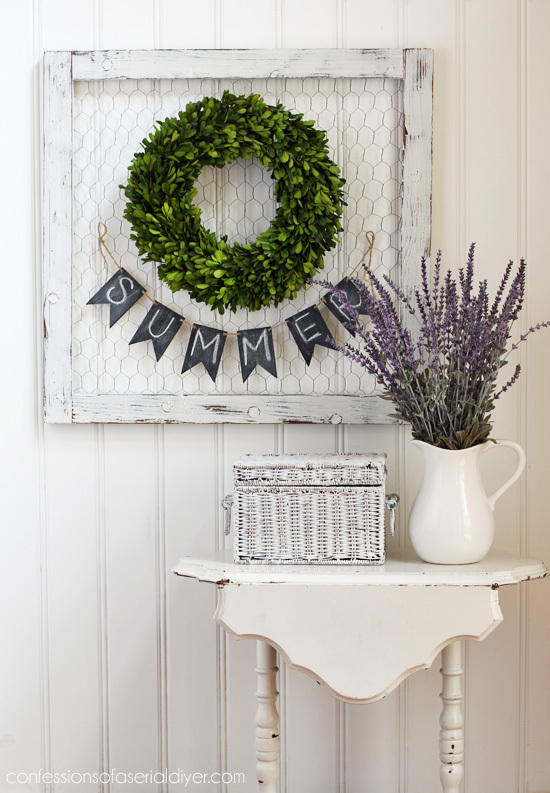 You really brought it into the 21st century and made it “farmhouse chic.” Love it! Love the transformation! What I truly love is the chicken wire in the frame. 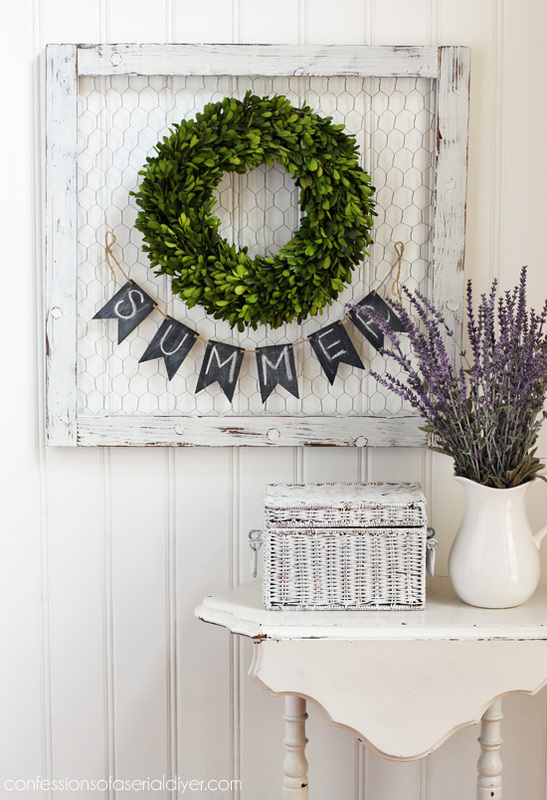 I have been totally In love with chicken wire for years. I think it looks so cool and thanks so much for all your hard work and taking the time to always keep us in the loop. Your personal response to your readers is one of the reasons I love your site, and of course all the beautiful inspiration! Awesome! you are a trash to treasure rock star! can’t wait to hear all about your adventure. Yep, I remember that artwork from days gone by. My grandma had it hanging in her house. I love the farmhouse update but I’m wondering how you have the wreath attached. Well that’s simple enough 🙂 Thanks! Love this project! I’ve gotta frame in the basement that I can use to make one. Can’t wait to hear about your trip! Thanks for giving your time for such a worthy cause! Oh my goodness! I had this in my kitchen so many, many years ago, in the late 70s. It was a Home Interior picture. I have seen so many of these at garage sales and thrift stores over the years. This makeover is WONDERFUL! Now I want to do one! Glad you had fun on your ‘road trip’! Totally loving the chic make-over on the frame Christy. 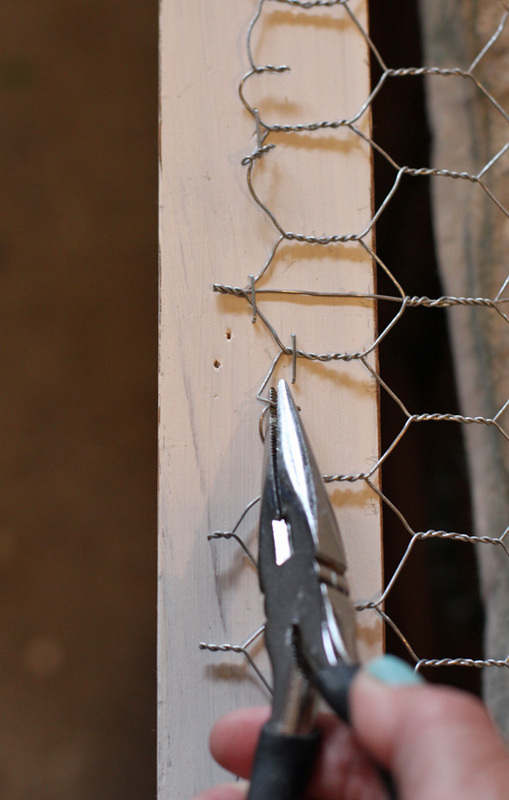 It will be so versatile too with the chicken wire insert. Thanks for linking up at Shabbilicious Friday this week. I’m thrilled to be featuring you at tomorrow’s party. 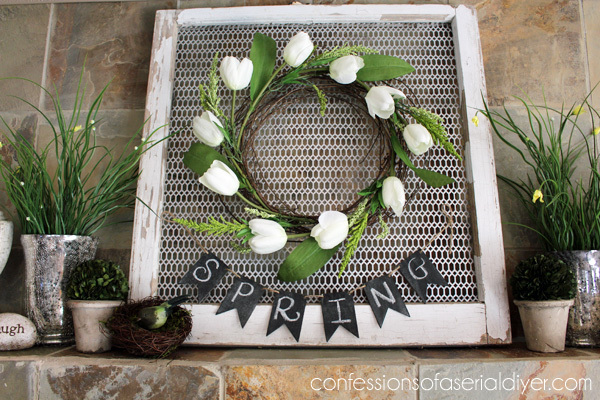 Great job I really like the wire frame and wreath gives such depth!….